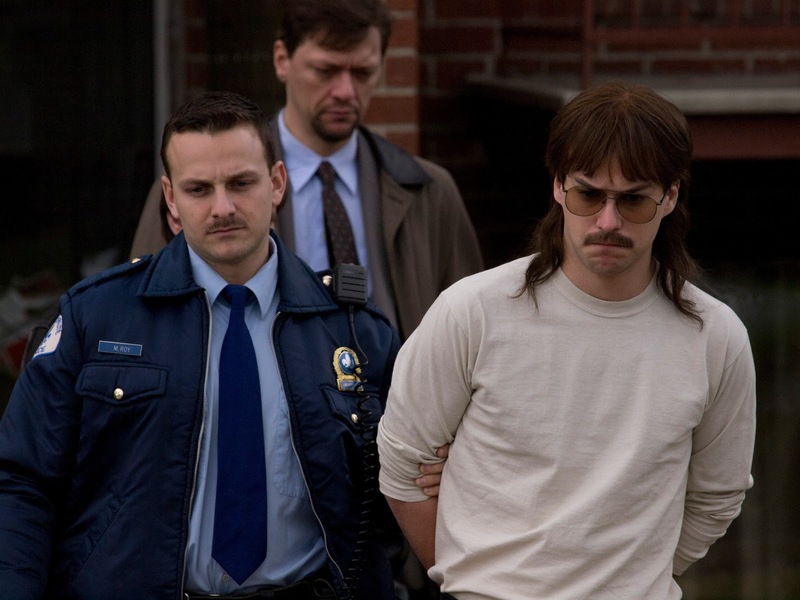 The film begins with a direct address from Dumont (played by C.R.A.Z.Y.’s Marc-André Grondin). Looking the camera head-on, Dumont protests his innocence. A police officer has come to visit and he requests that Dumont pose for a line-up photograph. Dumont observes that he fails to match any of the physical descriptions; however, seeming to be a kind, quiet, and patient man, Dumont complies because he believes he has done nothing wrong. Shortly thereafter, the film intercuts Dumont’s attempt to clear his name with flashback scenes that reveal his bungled trial. Hampered by a shoddy lawyer, an overzealous prosecutor, a prejudiced judge, and a series of unreliable witnesses testifying on his behalf, Dumont either seems to be a victim of circumstance or an offender unwilling to admit his crime. It’s only when Dumont, released during the pending appeal, meets Solange (Marilyn Castonguay) that he finds an ally to prove his innocence. Directed by Podz (real name: Daniel Grou), L’affaire Dumont is an absorbing look at a case in which the pursuit of justice went terribly wrong. Offering a steady hand at dramatic realism and an all-encompassing look at Dumont’s ordeal, the film bravely confronts the system that allowed such an injustice to occur. Moreover, the script by Danielle Dansereau underscores the social condition that made Dumont such an appealing candidate to local police and prosecutors who sought an individual to blame. Locating Dumont within a poor neighbourhood and a troubled past, L’affaire Dumont conveys the lateral effects of sexual, physical, and psychological abuse. Dumont’s own children become victims of violence when his incarceration throws them into a series of faulty foster homes, while Dumont himself is subjected to abuse in prison because of the crime for which he is convicted. The film focuses on the social situation of Dumont’s affair as much as it looks at the man himself, and it therefore presents a frank, sobering eye towards understanding the environments that might create acts of violence as well as the conditions that produce bias and an imbalance of justice. As Michel and Solange seemingly struggle against the world in their pursuit of justice, L’affaire Dumont might seem like a heavy-handed polemic as opposed to a ripped-from-the-headlines drama. However, as the opening title cards indicate, much of the dialogue in the film’s procedural scenes is a verbatim account of the minutes of the trial. It seems there is no need to create drama when real life is already scripted like an episode of Law & Order. The film, at times, does seem to take on a bit too much in its attempt to cover the twenty-odd years of Dumont’s process. L’affaire Dumont moves a bit too quickly in the opening act, so it’s difficult for one to get a firm hold on the situation emotionally. Likewise, some of the film’s flashback scenes are undeveloped, such as fragmentary glimpses into Dumont’s childhood that suggest that he too was a victim of abuse. The film becomes increasingly lucid as it moves along, but the exposition is a bit too disorientating. Such scenes nevertheless strengthen the film’s compassionate plight for victims of violence and they perform a necessary remedy for the ensuing development against Danielle Lechasseur, the woman who accused Dumont and then recanted her story. Rather than playing a game of “blame the victim”, L’affaire Dumont uses Danielle’s disillusionment with the affair to reveal the lasting psychological scars that abuse can leave on its victims. Played by Kathleen Fortin, Danielle is a compassionately and sympathetically rendered piece of the affair’s complicated puzzle. Especially notable, though, are the lead performances by Grondin and Castonguay as Michel and Solange. Honouring the resilience that their real-life counterparts faced on their long emotional journey, the actors bring an affective realism to their portrayal of these two fighters. Matched with the smart, simplistic direction of the film, the performances grant L’affaire Dumont a sense of poetic justice. Even if the legal system utterly failed Michel Dumont, this provocative dramatization of his fight is an unsettling essay on ensuring that such actions never happen again. L’affaire Dumont is currently available on iTunes.